Soft and slouchy or trim and tailored, suits were a near-constant feature on the Autumn Winter 2017 runways in New York this season without talk on the front row benches of the trend taken from Hillary Clinton. And with multiple styling options to probe for inspiration for example, high-waisted heros as at 3.1 Phillip Lim (right), colour power at the new Oscar de la Renta (left) or taper x tailor at Thom Browne (centre). 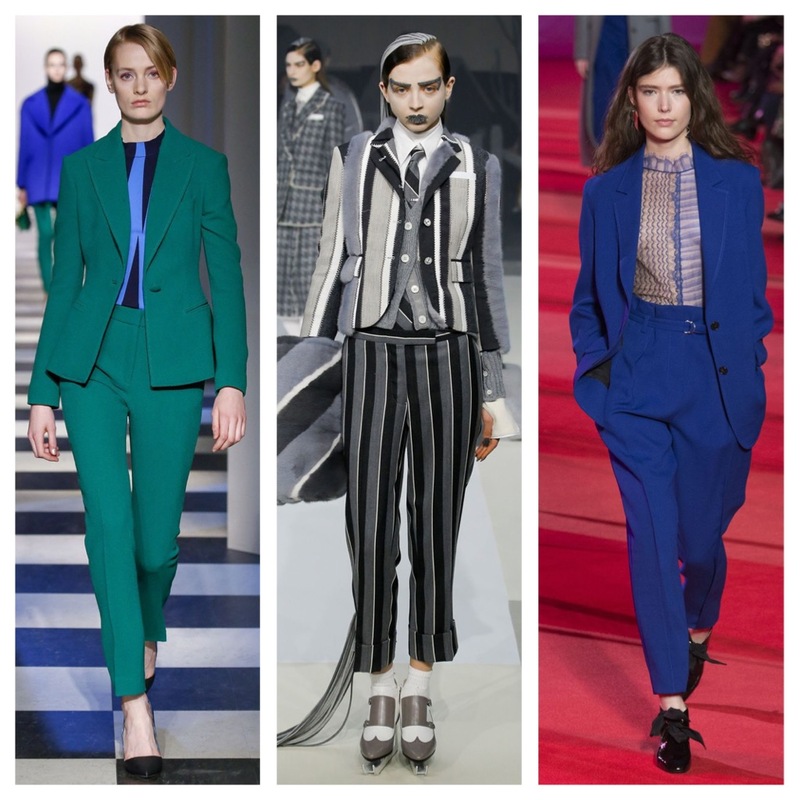 There is no reason we can’t all harness the power of the pantsuit next season. Be Boomerang ready for fall because, you will be swishing and snapping away. 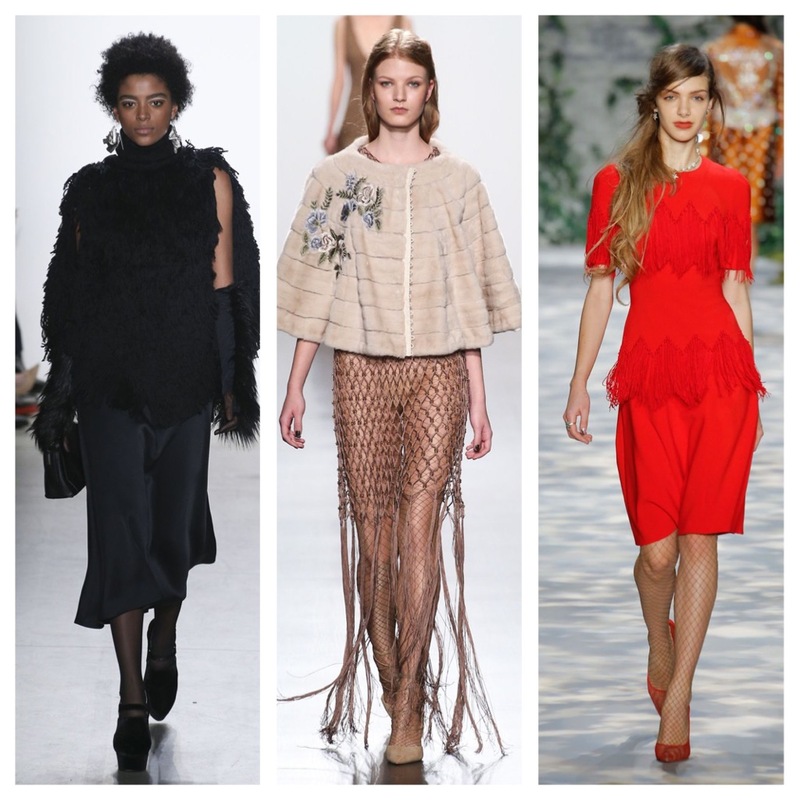 Whether it is strategically deployed on the hem of a skirt or cascading down the length of a dress, fringe added a sense of playfulness to many collections such as TOME’s (left) must have black sweater, bold cross body detailing from Jenny Packham right), Dennis Basso’s (centre) beautiful thigh to floor sultry trim or Michael Kors and his multiple fringed finales. It’s to be said, the best party pieces are made for shimmying. 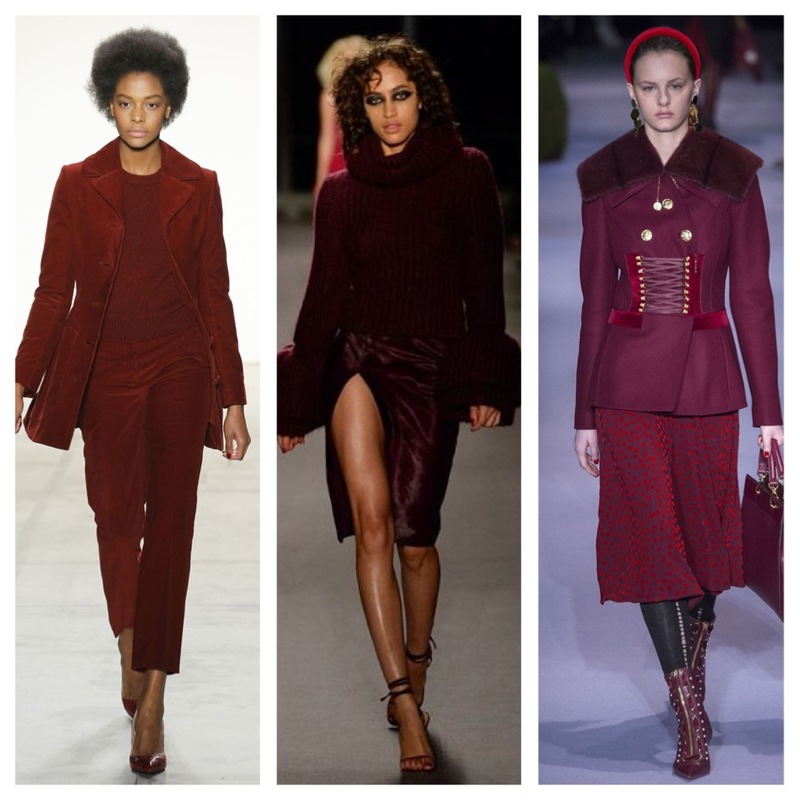 If there was one colour that ruled the runways from the first show of the week to the last, it was burgundy. Rich, deep and regal, the shade proved ideal for monochromatic looks, and elsewhere paired well with periwinkle or bright red. From tonal burgundy’s at by Joseph Altuzzara (right), Fleecy soft knits paired with velvet at Brock Collection (left), bell-sleeved babes at Brandon Maxwell (centre), burgundy fringing at Christian Siriano or Pamella Roland’s to-die-for evening wear. Call it tartan, plaid, or check whatever you want to call it—it was everywhere. It could be seen on Wall Street-worthy trouser suits, preppy pleated skirts at Public School, mannish coats at Calvin Klein (centre), Marc Jacobs (left) back to the 90’s street wear, mix and match, patches at Vivienne Tam (right) and even seen on evening gowns creating a fresh plaid feel at at Jenny Packham. Whatever the check, it’s covered. One to watch as the colour yellow isn’t always the easiest one to wear, but for autumn winter, designers turned to more forgiving shades of gold and saffron. To brighten up any runway across town, the colour particularly turned heads at Monse as duo Laura Kim and Fernando Garcia sent several shade of gold towards the cameras, appealing eveningwear at Carolina Herrera (left) alongside various shades of brash gold’s presented in a fresh alternative way to the little black dress we all know and love by Jason Wu (right), Cushnie Et Ochs (centre) with Marc Jacobs topping off with a trio of top tones at his no music, no runway, just models and iPhone show. Comfort is the number one trend we can all try at least relate too. On the runway it translated into oversized jumpers, fluffy coating and generous silhouettes. 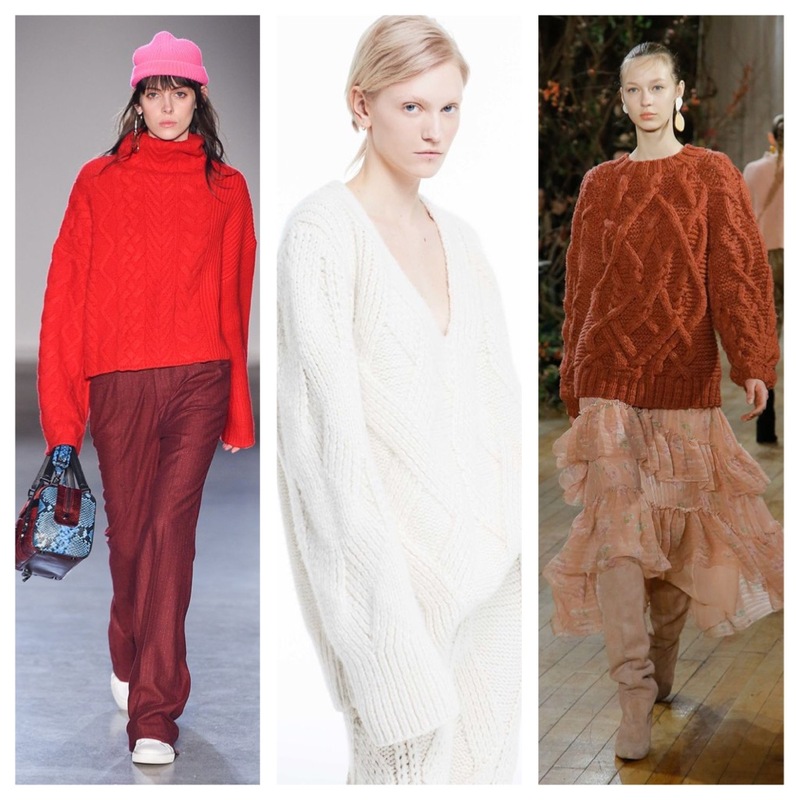 This season, Adam Lippes (centre) created dreams with his deep v-neck sweater and matching pants, quirky cable knits at Ulla Johnson(right), Zadig & Voltaire’s (left) oversized knit slash fringe slash colour but not of course forgetting, Gabriela Hearst – this years International Woolmark prizewinner bring the ultimate sleek comfort to your wardrobe. 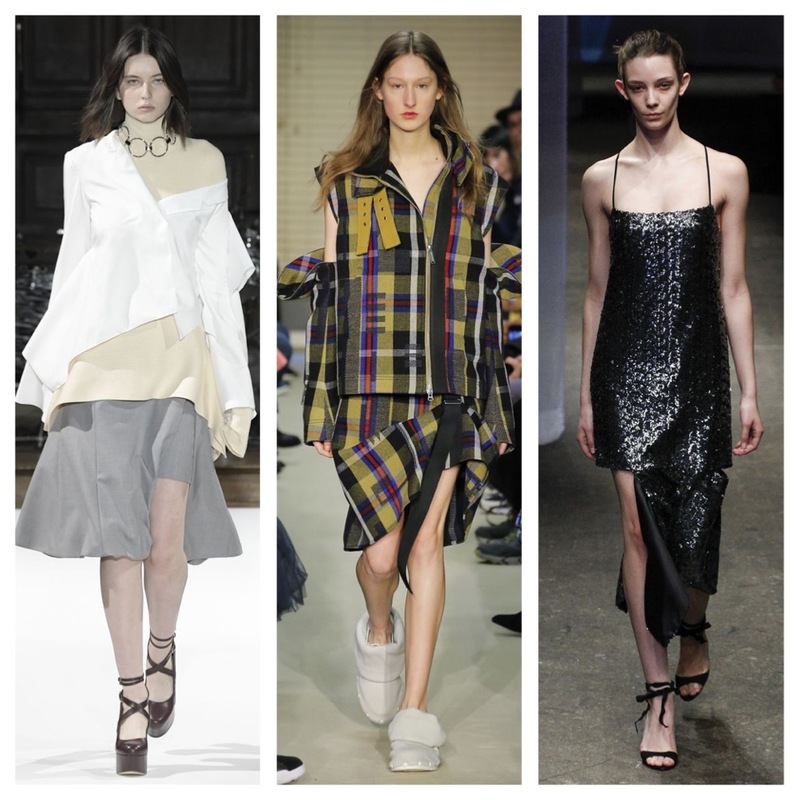 The trend dominated the Spring Summer 2017 runways but its back to say this season with sliced and diced pieces taking over the runway from ADEAM (left), Public School (centre) to MONSE who send every other piece down the runway deconstructed. Chunky knits torn into two with sequin dresses slashed at the hems at Milly (right), bold differences at Jason Wu and reworked lines at Tibi. 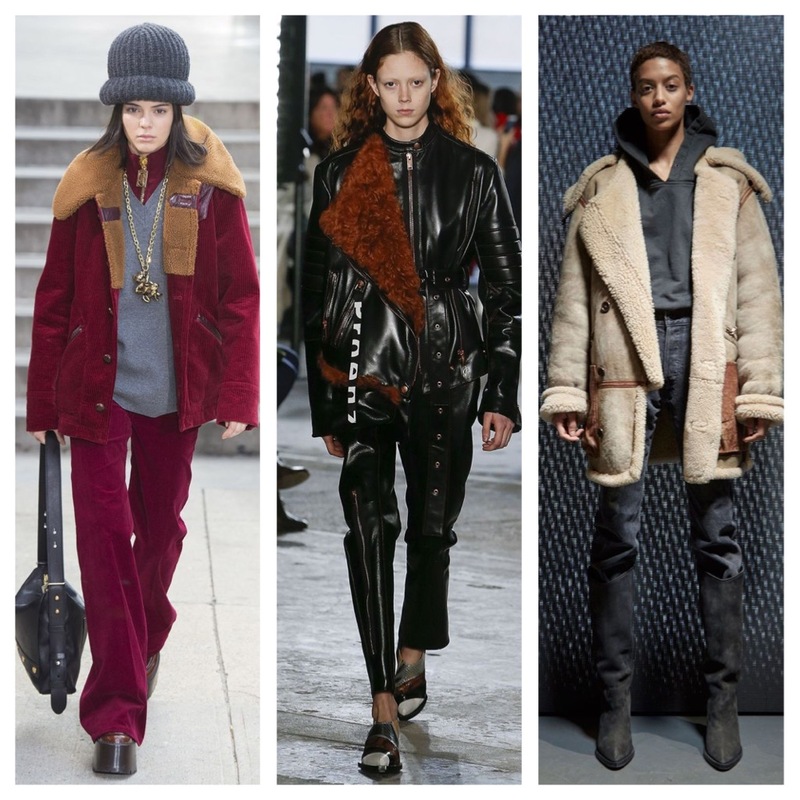 As the weather had more personalities than Courtney Love, shearling was a popular choice among the show-goers this season as well as a hit on the runway. 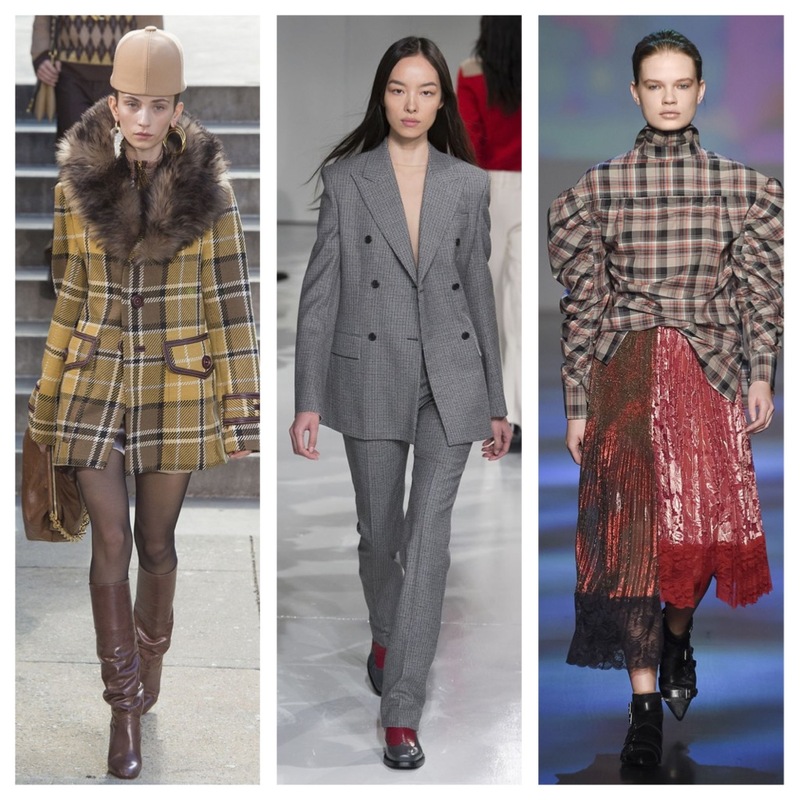 It came luxe and lacquered at Proenza Schouler (centre) with lashings of it seen at Yeezy season five (right), Lacoste had it covered with their back to the future collection as well as Marc Jacobs’s (left) show with Kendall Jenner strutting the pavements of the Upper East Side wearing a with a corduroy burgundy two piece with a soft shearling collar, that tipped its hat to ’90s hip-hop culture. Brands that would have normally held back and shied away from overt political statements in seasons past let their views known with parades of protest slogan tee’s at Prabal Gurung’s (left, centre, right) moving show where he sent his models out in T-shirts stamped with political slogans: “Revolution has no borders,” “I am an immigrant,” “Nevertheless, she persisted.” The parade ended with the designer in a tee of his own: “This is what a feminist looks like.” Joining in on the action across the week was CFDA with their pink “Fashion Stands With Planned Parenthood” badges and even a made-for-Instagram moment at Adam Lippes. Models carried signs reading “My Body, My Choice” and “Women’s Rights Are Human Rights” at Washington Square Park. This entry was posted in NYFW, Trend Reports and tagged 3.1 phillip lim, Adeam, Altuzzara, AW17, brock, brock collection, Calvin Klein, carolina herrera, CFDA, Christian Siriano, cushnie et ochs, dennis basso, jason wu, jenny packham, Joseph Altuzzara, marc jacobs, michael kors, Milly, Monse, New York Fashion Week, nyfw, oscar de la renta, pamella roland, Prabal Gurung, Proenza Shouler, Public School, thom browne, tibi, Tome, vivienne tam, Yeezy. Bookmark the permalink.